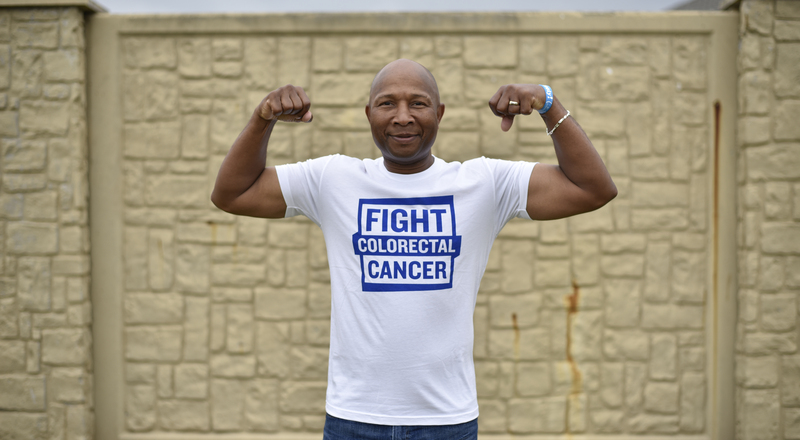 Texas Rangers third-base coach Tony Beasley teams up with Fight CRC, sharing his journey into survivorship and inspiring others in their fight against cancer. Tony Beasley has spent years in Major League Baseball making split-second decisions as a third-base coach, working to signal runners from second base toward home plate in the most critical moments of any given game. Little did he know that his critical thinking and competitive nature would come into play in his own life. In January 2016, Beasley, who coaches for the Texas Rangers, was faced with a stage 2 colorectal cancer diagnosis, leaving him with one crucial decision to make — how to fight the disease. His answer? With strength and tranquility, support from his wife and son and, most importantly, with his faith. Cancer-free since December 2016, Beasley has one thing left to do: tell his story. Toward the end of the Texas Rangers’ season in 2015, Beasley, who was 49 years old at the time, noticed that things didn’t feel quite right with his body. First, he began to develop hemorrhoids — something he had never experienced before — as well as sporadic blood in his stool. After speaking with the team doctor, Beasley was told he had three hemorrhoids and that one was likely bleeding, but that they would subside, which they did for a short while. However, in the off-season, his hemorrhoids continued, and Beasley started to feel a sharp pain down the right side of his leg. So, his wife finally urged him to visit a medical practice in Richmond, Virginia, where doctors conducted a colonoscopy to evaluate the situation. It was then that physicians discovered a tumor that ultimately led to a stage 2 colorectal cancer diagnosis. So, Beasley started treatment with rounds of chemotherapy and radiation, all of which he received at The University of Texas MD Anderson Cancer Center in Houston, Texas. He found that physicians there had an unusual philosophy: His oncology team told him they would focus on defeating his cancer, rather than on the stage of his disease. Although Beasley had never heard of this approach before, he not only accepted this frame of mind, but fully embraced it. Beasley continued to work while going through treatment. He even made it to the ballpark with the chemotherapy drip pump still attached when he had undergone treatment the same day. In particular, Beasley says he focused on the fact that his cancer was something that would, one day, be over, and that it would never defeat him. He focused on controlling the treatment process rather than letting it control him. In maintaining a tough mentality throughout his fight against colorectal cancer, Beasley says he found the most strength through his faith. On the Friday before his very last surgery that was scheduled for the following Monday, Beasley had CT scans to evaluate his tumor before it was removed. It was then that his doctor, George J. Chang, M.D., told him the tumor still appeared to be significant and of concern, and that Beasley might have to wear an ostomy bag permanently. The surgery lasted seven-and-a-half hours. During this span of time, Chang updated Beasley’s wife with some great news: The tumor that had caused significant concern only days before was pretty much gone, and simply reduced to scar tissue. “It was this amazing thing, and I believe that was the work of God. From Friday to Monday, there was nothing that could have happened medically; it’s just that things happen spiritually,” says Beasley. Since that surgery in April, Beasley had one more procedure to remove the temporary ostomy bag that doctors had warned could be permanent, and has since been fine. Through his journey, Beasley learned what is most important to him in life: his wife and son, and his time spent here on Earth. To help with this initiative, Beasley has teamed up with Fight Colorectal Cancer (Fight CRC; fightcolorectalcancer.org), a national advocacy group that seeks to find a cure. As part of Fight CRC’s One Million Strong movement, Beasley is sharing his journey through the Let’s Fight campaign to highlight how important it is to pay attention to your body, and to maintain a positive attitude, despite a cancer diagnosis. To learn more about Fight CRC’s One Million Strong campaign, visit: FightCRC.org.